This entry was posted on 22nd October 2017 by WoodBlocX. Long and thin, short and stumpy or round; orange, purple, white, yellow and red: there’s more to carrots than the basic orange ones that fill the bags in the supermarket. Growing your own means you can access this wide variety of shapes, colours and tastes, and also means you are able to eat them quickly after the harvest. The longer a carrot is out of the ground, the more of its natural sugars will convert to starch: for the best tasting carrot ever, just wash off the soil and eat it there and then, straight from the plot. Raised beds are ideal for growing carrots. The enormously long ones seen at village shows have all been grown in some kind of container (usually drainpipes filled with sand). There’s no need to go that far for the veg for your Sunday lunch, but the principle is the same. Carrots will fork, bend and generally distort in stony, lumpy and heavy soil. Growing in a raised bed means you can give them the perfect growing conditions and create perfect carrots, whether the beds are standing on a hard surface or just raising the soil level a bit over the top of the garden soil. Just make sure your carrot rows are not directly above any buttresses inside your WoodBlocX beds! 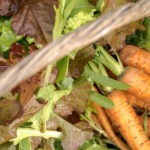 The lighter the soil the better for carrots, so don’t add any manure or other compost the same year you sow them (though the previous autumn is fine). Multipurpose compost and stone-free topsoil are both ideal. It’s possible to grow carrots for harvesting from early summer right through until autumn, and left in the ground some will even be fine to harvest into winter, such as ‘Autumn King’. Check the seed packets for the correct sowing and harvesting time for that variety so you have a succession of harvests and no major gluts. If your beds are relatively shallow it will be best to choose shorter or round varieties like the Nantes series and ‘Paris Market’, but beds with at least 45cm growing depth are fine for most carrot varieties. Some seed retailers offer packets of mixed seed, which is a good way to get a multi-coloured harvest, and there’s no need to choose a different type for each successional sowing, as most will be fine sown over a long period. Carrots are best sown direct into the soil (i.e. not raised in individual pots or plugs then planted out), as is true of most root crops. Scrape out a shallow drill – a line in the soil – and water the bottom of it before sprinkling the seeds thinly along it. You want one seed about every centimetre, but there’s no need to be exact! Brush the soil you scraped out back over the top of the seeds and pat down gently. Most importantly, label the row with the variety and the date you sowed it. Water, using a rose on the end of your watering can or a spray hose – this helps prevent the seeds being washed out of their line, if the weather is dry. The soil should stay moist but not wet. Once the seedlings have poked up some leaves, wait for a few weeks before pulling one up to check the root size. At a 1cm spacing the carrots are too close together to give a good harvest, and will need thinning to leave one every 5cm or so. However, if you wait until the roots are usable as baby veg, and take out every other plant until you reach the 5cm spacing, you’ll get several harvests from the same row.